Ze Macedo is a third year Philosophy, Politics and Economics student and entrepreneur. Ze currently runs two businesses. The first of these is Prodigy Consulting, a tech consultancy which hires top university students for web development projects. The second is the Kaizen Academy, a Brazilian Jiu Jitsu, Kickboxing and Mixed Martial Arts academy in Lancaster. 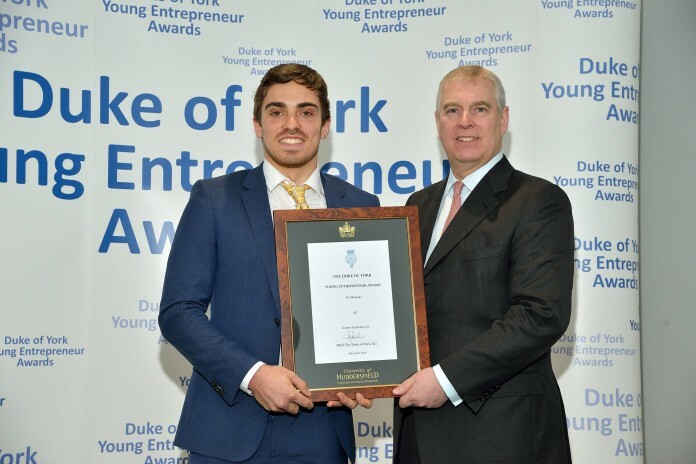 Ze was recently recognised for his business endeavours by Prince Andrew, when he was given the Duke of York young entrepreneur award. How did you come to start Prodigy Consulting? Is this your first endeavour into tech? In 2012, I was launching my first start-up and needed to find someone to make me a website. I spent some time researching the options and found a strange situation. On one end of the spectrum there were the web development shops which wanted to charge me £25k+. On the other end of the spectrum there were freelancer websites like elance and odesk which, while much cheaper, often provided low-quality labour and horror story experiences. Since I didn’t want to spend £25k, I ended up going with the latter option. After nearly a year of development (for a website that was meant to take 2 months) and many hours of phone calls to India, I knew there had to be a better way. So, I began to approach the top technical universities in Portugal in order to try and hire their best students. What I found was shocking: these students were programming prodigies with 4.0 GPA’s, incredible portfolios and contributions to prestigious open-source projects. However, many of them were working as cashiers at supermarkets, waiters, cleaners etc. earning 5 euros an hour as they could not find programming work due to not having a degree. I ended up hiring a few of them to work on my own projects and the results were amazing. The work was done much faster and better than anyone I’d worked with in the past and at 10% of the cost. I realised there was something here and began to have them work for other people I knew who needed websites. The positive feedback kept coming in and we began hiring more programmers and eventually designers from top universities in order to provide a full web-development service. We now have 10 programmers and 4 designers working for us. What about Kaizen Academy? How did you become involved in martial arts? I started doing martial arts about a year before I came to uni but it was when I started going to the sports centre class taught by Kieran O’Brien, Adam Gregory and Michael Wood that I really fell in love with it. Their approach was completely different than anything I’d experienced before. Since they were black belts and national champions in various different martial arts, they didn’t prescribe a specific art, instead teaching you the basic principles behind all martial arts and allowing you to find your own game based on your preferences. They also had a remarkably un-hierarchical and open approach teaching method, encouraging students to look to question and improve what was taught. Due to this, the classes had a really great atmosphere with people from all backgrounds and skill levels having fun exploring the world of martial arts. So, I approached them to create our own academy in Lancaster, a place where the sole aim would be to create the perfect setting and atmosphere to explore the world of martial arts together. How can students join Kaizen Academy? We’ve currently got ~130 members, roughly half of which are students. For most of them it’s been their first experience with martial arts and we’ve been constantly shocked by how quickly they’ve gotten good. Most importantly, everyone seems to love it! We’ve received some really flattering reviews on our Facebook page and you can read them for yourself here: https://www.facebook.com/kaizenlancaster/reviews. We made it a priority from the start to encourage students to train by offering great discounts (a third off on memberships) as we’ve found students are intelligent and thus pick things up quickly. They also create a great atmosphere. To join, all you’ve got to do is message or call us to book your free class or simply show up. We’re located on Bulk Road, about a 5 minute walk from the main Lancaster bus station. We give everyone a free “foundation” class before they join which is a 1 on 1 session with one of our instructors, where they take you through the main concepts behind the arts so you can get a feel for what it’ll be like before you sign up. You can find all the info on our Facebook page above or our website: www.kaizenlancaster.co.uk. You have run a few businesses that didn’t work out. What did you learn from these experiences? I’d say the most important thing I learned from failure was that it can happen even when you’re sure it can’t and that you must accept that before you start. In second year I created an app which I knew would get a lot of users quickly. I worked on it all day for 3 months: conceiving, creating and marketing the app. It was pretty tedious – I wasn’t really passionate about the idea or the work involved but my plan was to do it for a few months before selling the company for a nice profit. Things went even better than I expected and in the first week of launching the app had almost 10,000 downloads, multiple investment/acquisition offers and a lot of high profile press coverage. I was just about to close one of these acquisition offers when Facebook changed their permissions policy, rendering the app unusable. I was angry and depressed and felt like I had just wasted 3 months of my life. I realized then that no matter how sure you are of something or how well you execute, failure is always an option. I decided I’d only work on stuff that I would do even if I was sure the only outcome was failure. How do you find running your current businesses alongside your degree? It’s quite busy. However, it’s also quite helpful as it forces me not to waste any time and to focus on what’s really important. As a Politics, Philosophy and Economics student, has your course impacted how you think about business? If so, how? I guess it hasn’t that much, but I don’t think it needs to. I start businesses because I find it interesting, challenging and enjoyable and I study PPE for the same reasons. I really enjoy my course and find it interesting to study for its own sake. It’s probably quite old-fashioned, but I’ve never liked this idea that universities should make you “employable” and give you job-specific skills to prepare you to enter the “real world”. I think university is a great time to find out about all kinds of different things that interest you and just satisfy your intellectual curiosity.